City staff continue to work on revenue related actions identified in the LTFP and will report back on individual strategies and key actions, as appropriate following the start of the 2018 to 2022 term of City Council. The City’s 2018 operating budget, including both tax and rate supported sources, amounted to $13 billion, and its 2018 capital budget amounted to approximately $4 billion. 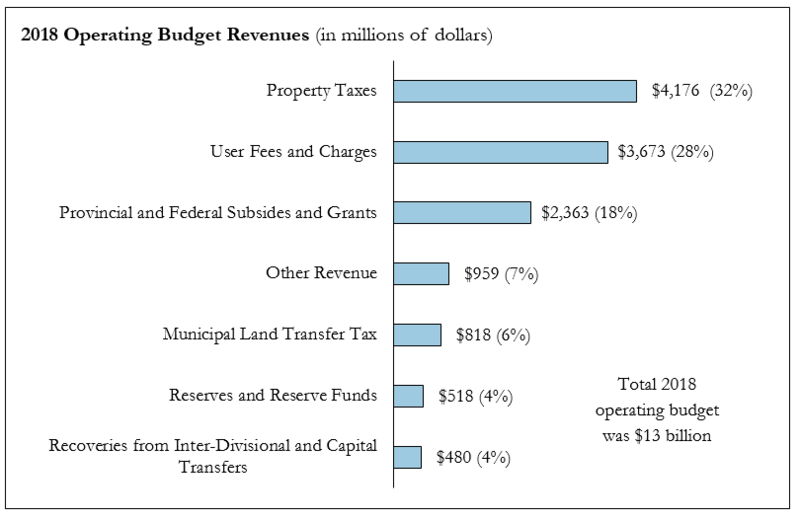 Since 2009, the City’s three principal sources of funding, property taxes, user charges and the Municipal Land Transfer Tax (MLTT), have exhibited positive but varying rates of revenue growth. Property taxes have grown slightly below the rate of inflation. User charges have grown by approximately 5 to 6 percent annually due to increases in rates, and the MLTT has increased approximately 20 percent annually, which is not sustainable. Property tax is the largest source of the City’s revenues ($4.2 billion or 32 percent of the 2018 operating budget). A further $2.2 billion in property taxes are collected on behalf of the Province of Ontario to fund the cost of education. Tax rates for the municipal portion of taxes are determined by City Council to raise the taxes needed to meet the City’s approved operating budget of that year. Tax rates for the education portion of taxes are set by the Province each year by regulation. User fees such as rates for water and solid waste, transit fares, and permit fees, are an important source of revenue. Approximately $3.7 billion, or 28 percent of the 2018 operating budget, is funded from user fees and charges. The largest of these are transit fares, at 10 percent of operating budget and user fees & charges, primarily from water rates ($1.2 billion) and the Solid Waste bin fee ($0.3 billion). The City of Toronto Act, 2006 (COTA) enables the City and its agencies to charge user fees to recover the cost of services. In September 2011, City Council approved a User Fee Policy, which provides the framework for managing the City’s user fee program. This policy applies to all City programs and agencies. user fees should be set to recover the full cost of those products and services, to the extent that there is no conflict with City policy objectives or other legislative requirements. Many of the City’s over 3,000 user fees remain only partially cost recovered. Annual inflationary adjustments are, however, automatic and effective January 1 each year as determined by the Chief Financial Officer. The inflationary adjustment for each fee is set based on market prices or changes to the cost of providing the related services. MLTT is a tax on the title transfer of real property. The 2018 MLTT revenue budget is approximately $818 million (gross) or 6 percent of the 2018 operating budget. Since the MLTT was introduced in 2008, MLTT revenues have been the dominant source of revenue growth in a period of low property tax increases, bringing the City considerable and unforeseen revenue increases, along with increased revenue volatility. Due to the introduction of a combination of public policies and market measures, including the Ontario Fair Housing Plan in April 2017, the federal mortgage stress test introduced January 1, 2018, and consecutive interest rates increases, the Toronto real estate market has slowed down substantially compared to early 2017, particularly in the resale housing market. As of September 2018, resale residential transactions in the city of Toronto were 17 percent lower than the same period last year. New condo unit and non-residential transactions in the city of Toronto (combined about 50 percent of the MLTT revenue base) have also declined, but are offset somewhat by higher selling prices in the condo market and several large commercial transactions. approximately $0.7 billion, or 23 percent of the 2018 tax-supported capital budget. Examples include Provincial subsidies for cost-shared services (such as Ontario Works, court services, emergency medical services, and public health), permanent federal and provincial gas tax funds, and infrastructure funding available through the Public Transit Infrastructure Fund (PTIF) and Building Canada Fund (BCF). Areas where the City is facing the most significant funding pressures, requiring new or additional federal and provincial assistance, include transit and social housing, both operating and capital. In March 2018, City staff presented Executive Committee with the LTFP. The key actions and strategies contained in the LTFP are intended to improve the long-term financial stability of the City. Link property tax increases with multi-year expenditure commitments. Continue to address the disproportionate burden on businesses and renters. Study changes to the application of property taxes. Reduce the cyclicality of MLTT by allocating an appropriate portion of budgeted revenues to capital reserves. Develop a user fee pricing strategy based on the full cost of the service & City Council-approved policy objectives. Ensure that land development levies appropriately pay for the cost of growth. Identify opportunity costs and report annually on all tax and fee discounts, waivers, rebates, deferrals and exemptions. Continue to consider other revenue options.